I was recently intoduced to a site called 'Fist-a-Cuffs,' where artists submit characters that battle each other by means of vote tallying. Most recently they were looking for submissions of team fighters, where two different artists would design their own character to fight together tag-team stylez. Maris and I decided to make a go for it. 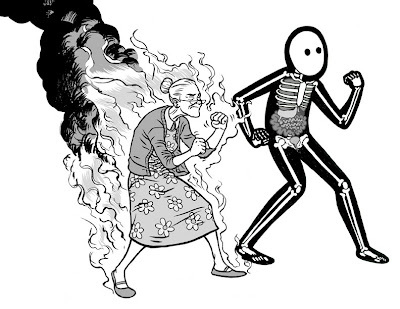 Behold Team: Skin & Bonez, featuring The Flamin' Granny, and X-Ray-Ray.